Beautiful Jugs at Pomelo for Myanmar, Yangon. Fair trade crafts shop. Produced in a variety of colours and sizes by Helping Hands, based in Yangon. 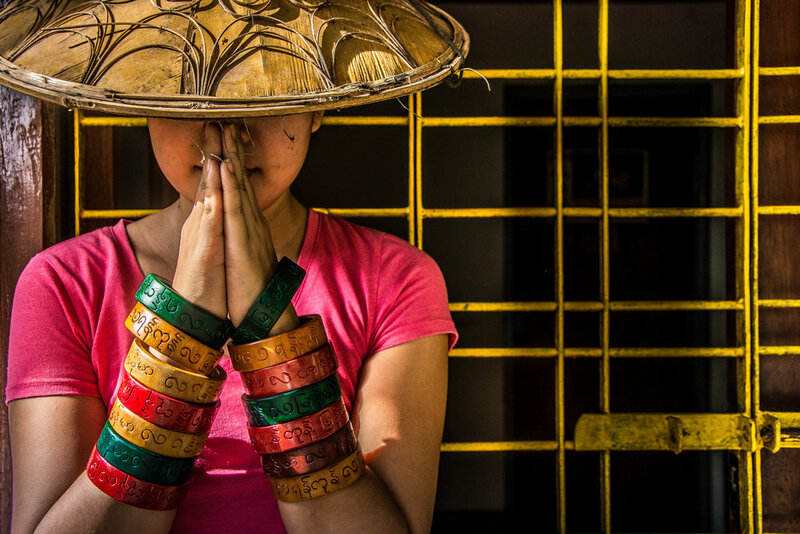 Intricate Bracelets at Pomelo for Myanmar, Yangon. Fair trade crafts shop. Hand Woven Rattan Baskets at Pomelo for Myanmar, Yangon. Fair trade crafts shop. 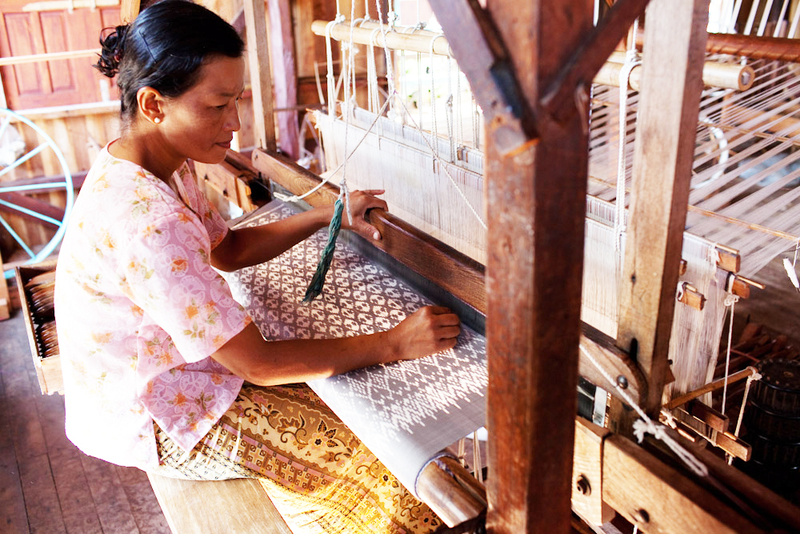 Skillfully produced tradtional textiles at Pomelo for Myanmar, Yangon. Fair trade crafts shop. Produced by Rakhine State Weavers. Much like it’s namesake fruit, Pomelo is vibrant, bursting with an energy and vitality that is unique to Myanmar. Pomelo is a Fair Trade marketplace supporting social businesses throughout Myanmar. Pomelo connects design and impact: every purchase made contributes to social and economic change in some of Myanmar's most marginalised communities and helps to support unique skills and craftsmanship. Pomelo aims to make lasting impact by providing its artisan partners with training and education, as well as economic reward. Proudly supporting a diverse range of groups and products, handpicked and nurtured by the Pomelo team. The products range from reclaimed teak candle holders, created by former street children who have been trained in traditional carpentry, to handmade soap, created by refugee women in Kachin State. Join the movement #DesignForChange, by visiting the Pomelo retail outlets in Yangon and Bagan, where your purchase contributes towards a brighter future for the country and it’s people. Pomelo nurtures local talent by providing design and product development training and business mentoring. This support allows our artisans to reach their full creative and market potential. Pomelo promotes distinctive, high quality products at affordable prices, so that our customers receive lasting enjoyment and our artisans build sustainable businesses. Pomelo creates opportunities for artisans to build business and creative skills, earn vital income and foster dignity and fulfillment for themselves, their families and their communities. Pomelo works toward the 10 International Fair Trade Principles. ThiriPyitsaya 4 St, Nyuang U. Next to Weatherspoon restaurant.